The replacement for the Lamborghini Gallardo will be called Huracan. The name, which means hurricane in Spanish, will adorn the new V10-powered supercar due to be unveiled later this month. Lamborghini was tipped to call the Gallardo successor the Cabrera, but sources has mentioned a strong possibility of the car being called Huracan instead. Lamborghini trademarked then name on April 19, 2012. The word was Mayan for the god of fire, wind and storms, and was then adopted by the Spanish to mean hurricane. The name was trademarked at the same time as Urus – the name for the firm’s SUV concept shown at the Beijing Motor Show in April 2012. The firm also registered Deimos, which hasn’t yet appeared on a car or concept, but could be used for the production version of the SUV, due in 2017. The Huracan is tipped to be powered by an updated version of the current naturally aspirated 5.2-litre V10 mated to either a six-speed manual or seven-speed twin-clutch gearbox. The engine will develop around 600bhp. It’ll be built on a new aluminium spaceframe platform that will also underpin the next Audi R8 in 2015, albeit with different dimensions. Originally, both the Audi and Lamborghini were to use an updated version of the current R8’s platform. However, an insider told us that having driven the latest 991-generation Porsche 911 Turbo, Audi and Lamborghini engineers decided that a more radical solution would be required to reach the Porsche’s high level of dynamics. The Lamborghini’s design will be inspired by the Sesto Elemento, which debuted in 2010, while the starter button shown on the Huracan teaser website has a similar jet fighter-style flip-up starter button as the Aventador. The Huracan will go into production in the new year, and be officially unveiled at the Geneva Motor Show in March. It has big shoes to fill – more examples of the Gallardo have been sold than any other Lamborghini, with 14,022 finding homes in its 10-year production run, which has just come to an end. 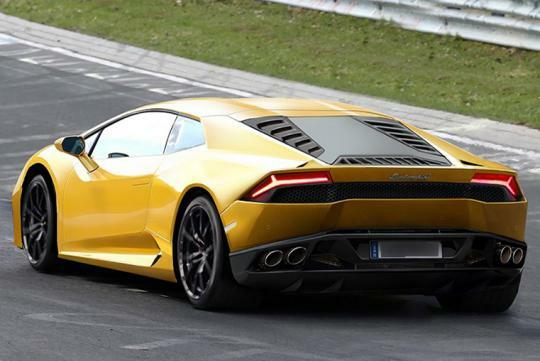 At just one glance, this Huracán is totally Gallardo inspired. And the rest, an 80's Ferrari design. It looks pretty much a beauty here, no doubt about it. A mix of the vintage and the modern. So here's the replacement. It looks much alike. Never doubt its design and shape. Lambo has never failed us! AWESOME!